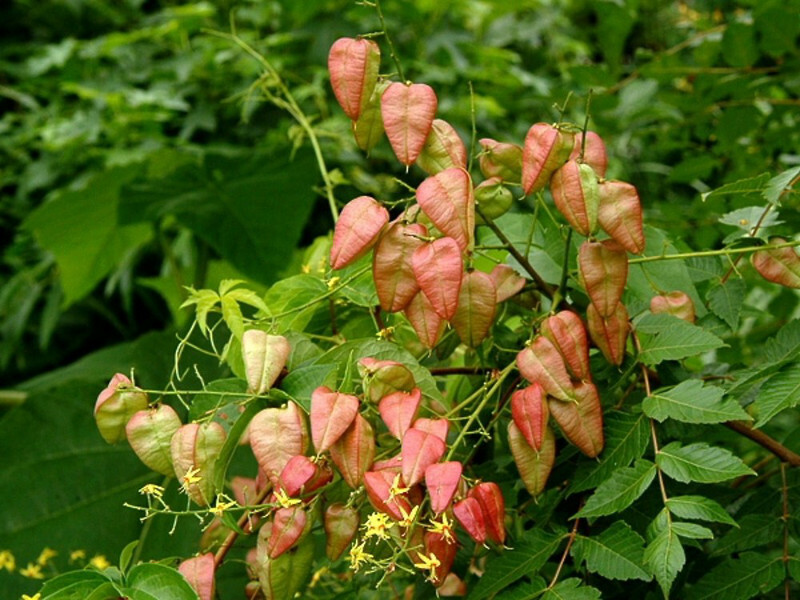 The Pride of India Tree or Golden Rain Tree (Koelreuteria paniculata) is a very attractive large headed tree with attractive reddish leaves in spring turning to dark green, then brilliant bright yellow in Autumn. 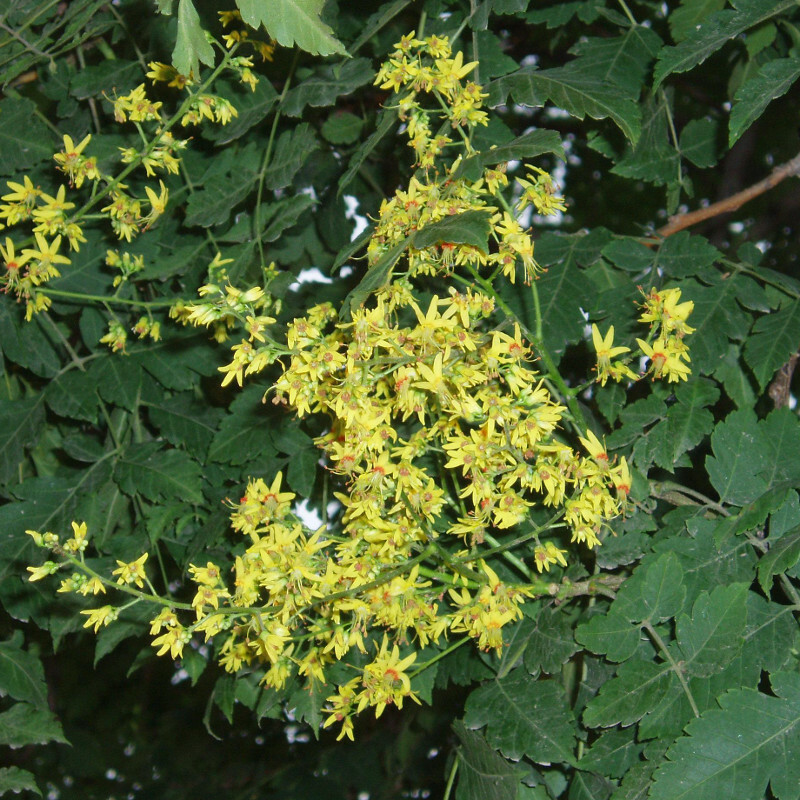 Larger panicles of small yellow flowers in July/August, followed by bronze-pink or red`bladder` fruits. At some point in has received the Royal Horticultural Society Award Of Garden Merit which means people that spend a lot of time in sheds and allotments have become known as experts in their field (no pun intended) and have decided that when compared to other similar trees, the Golden Rain Tree (Koelreuteria paniculata) has particularly outstanding features. You can take their word for it, or buy one and see for yourself. For best results get a gardening expert to do all the work for you that comes with a guaranteed results or your money back offer. Failing that because you live in the real world, plant in well draining soil in a sunny and sheltered position. You can plant in not so perfect conditions but expect not so perfect results. The flowers can be a little shy for the first three to five years depending on local conditions but once out, they would be expected to attract wildlife. If they do not make an appearance after five years then it might be that some strange political party is in power e.g. UKIP and your Golden Indian Rain tree flowers are hiding until an election or revolution happens. The Golden Rain Tree (Koelreuteria paniculata) has a good range of yearly colours to maintain garden interest all year round. They range from green to purple, orange and yellow. If you see colours other than these then check the leaves for paint or remove your tinted sunglasses. Just like the Julian Assange embassy saga, the Golden Rain Tree (Koelreuteria paniculata) prefers to be left alone. So if you go near it with a set of pruning shears, it will be using its internal voice to tell you to clear off. The shape of our Golden Rain Tree (Koelreuteria paniculata) is upright and rounded so taller than it is wide. Expect a height of approximately 3m (10ft) after ten years but could go on to grow around 8m depending on local conditions. Very local sink holes and old mine shafts collapsing could have a significant and detrimental effect on the height of your tree. Should you want an instantly taller Golden Rain Tree, we suggest planting at the top of a hill and buying a house at the bottom or stooping a lot when in the garden. This tree is supplied at a height of 1.3-2.0 metres in a 7-15 litre container.